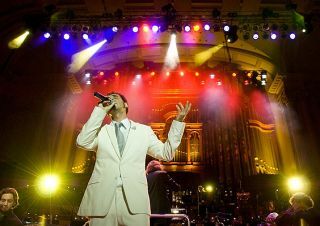 There were nothing but highlights as Serj Tankian teamed up with the Auckland Philharmonia Orchestra. It wouldn’t be often that a tuxedo-clad member of the Auckland Philharmonia Orchestra gets the opportunity to «throw up the goat» — the international hand gesture for metal fans — to a crowd. With its second release in a year (following «Mesmerize» in May), System of a Down has lost shock value. Not that the band’s blend of metal; world music; jagged, breakneck rhythms; and non sequitur lyrics don’t still connect, but it is nowhere near as dazzling as it was on its first two go-arounds. That said, there are still some great songs on «Hypnotize,» including the plaintive «Lonely Day,» SOAD’s most emotionally straightforward tune to date. The band can still dazzle with its odd blend of thrash riffs and catchy choruses («Tentative»), and «Vicinity of Obscenity» is one of the most twisted, perverse and silly songs it has written. But the band is nearing the oversaturation point: «Mezmerize» and «Hypnotize» might have made more impact if they were released at once instead of spaced apart. System of a Down cares. The Armenian-American quartet from Los Angeles knows that listening to its albums is like being pummeled by heavy metal guitars while drowning in a sea of encyclopedia pages. Knowing that the attempt to digest two albums of political rants punctuated by punishing guitar solos and stop-start melodies may cause their fans’ heads to explode, the band divided its recent album in two.